There is one in every group. Have you ever gone to a class, seminar, party, or generally anywhere there is a group of people gathered and find there's always that one person who seems to know everything about everything, but when it comes down to brass tacks, they don't really know anything? Or those people that have such a strong sense of entitlement, one would think they fell off the royalty wagon? Lucky me, I met said person all in one go. Just before the holidays, I attended a cooking class with a friend to broaden my horizons, if you will. I'm always eager to learn new tips, techniques and of course, recipes. If I can make something at home as opposed to buying or ordering it, I am all over it. There was a woman in this class I knew I was going to have issues with the moment she walked in the room. First off, she was late - an unapologetic nine minutes late at that. If I'm late for anything, I am apologizing profusely the moment I enter the room. My face is usually red from embarrassment and my coat, bag, and other personal belongings have already been removed and tucked away along with the tail between my legs to avoid any more interruption. Secondly, she leisurely strolled through the door while texting on her phone, not even acknowledging anyone else was in the room. Our instructor had to clear her throat to get her attention. Her response? "Oh". Then it started. About 10 minutes into the lesson, the know-it-all comments let loose. "Well I use this...." and "We do it this way in my house" and my personal favourite, "When I was in Italy for five minutes, twelve years ago….". Normally, I just would roll my eyes and feel sorry for people like her, because really. Why do people make such spectacles of themselves in public? I'll tell you. For attention. However, I paid just as much for the class as she did. I've walked away from other classes in the past with these same said people in attendance, didn't say anything, and cursed the live long day when I couldn't recall something I learned because I was too frustrated thinking about the person interrupting the class. I would kick myself if I didn't say something. Just as I was getting my nerve to pipe up, the woman next to her spoke up. Seriously, it was almost as if the mental frustration gods heard me, but knew my hesitation. "Why are you here? If you know what you're doing, why come?" Well, grab the popcorn folks because if looks could kill. As soon as she picked her jaw from the floor, she retorted that she was "rude" for asking such a question and that she was "only trying to help the 'novices' in the class". Novices? Seriously? Could this get any better? And to be fair, the woman was very nice about it. She wasn't rude in tone; she was only asking. Thankfully, before an all out cat fight started, the instructor brought it back to a civil manner and asked that all comments be held until the end of the session, but you better believe there was some serious huffing and puffing coming from her end of the table. The comical part about this whole situation was when she got on her phone (after class thank goodness) and complained to the person on the other end that she didn't learn anything she didn't already know! Imagine that. Did she not read the single paged, double spaced, large, bold font leaflet describing step-by-step what the class would entail? I'm thinking not. Then she tells the caller that she "could have taught the class". Uhhh…. Yep. One in every group. Sort of like chocolate cake. There are some chocolate cakes that stand out amongst the crowd; some so incredible, it should be illegal. I like to think this is one of them. It's dark. It's rich. It's decadent. Best of all, it's easy. In fact, it's so easy, even a, *ahem*, 'novice' could do it. Preheat oven to 350ºF. Spray mini bundt pan with a non-stick cooking spray, preferably one with flour added. In a large mixing bowl, sift together flour, baking powder, baking soda, sugar, cocoa powder and salt together; set aside. 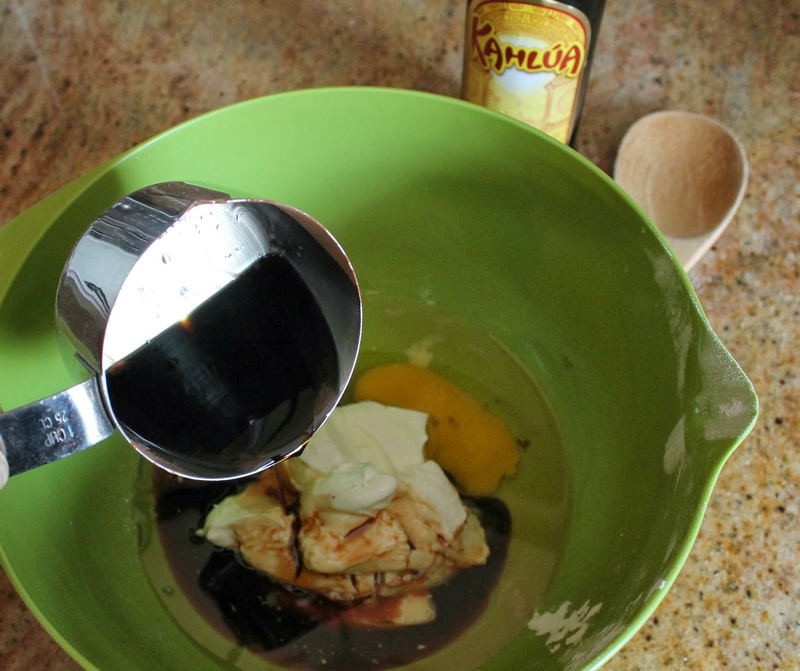 In another large mixing bowl, using an electric mixer, beat together sour cream, eggs, vanilla extract (or paste), Kahlua, and vodka until fully incorporated. Slowly combine dry ingredients into wet and beat just until incorporated. Divide mixture into bundt pans and place in oven. Bake for 25 minutes or until a skewer inserted comes out clean. Remove from oven and allow to cool slightly before turning out. Place on wire rack and cool completely. In a saucepan over medium heat, add heavy cream, butter and golden syrup. Once melted, turn heat to low and add chocolate chips. Whisk together until smooth and creamy. Remove from heat and add Kahlua and salt. Whisk until fully incorporated. Pour chocolate sauce into a dish and allow to cool to room temperature. 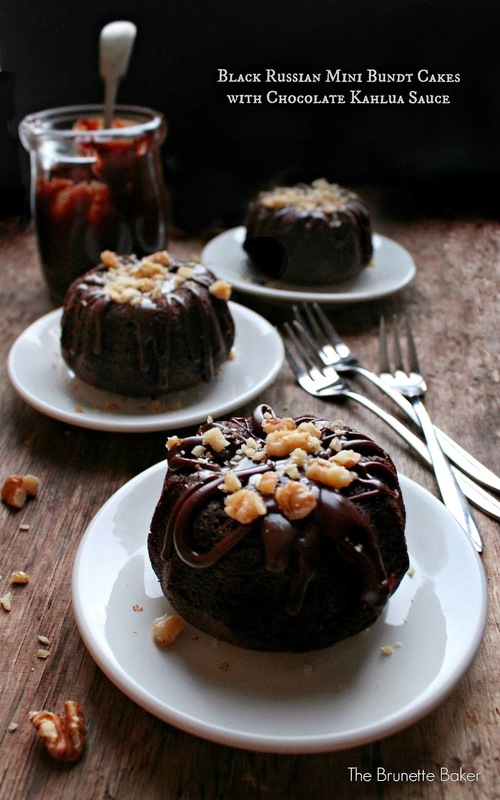 Pour chocolate sauce over bundt cakes. Best when served warm. I also love the addition of walnuts to this cake, but it's really nice without them as well. Does Kahlua go bad? I've had a small bottle in my pantry forevs, and now i finally have a recipe to make with it! Yay! I loathe people like that too! But usually they amuse me because eventually they fall flat on their faces or screw up majorly. I wait for that moment. It happens eventually. It's so true, Janice! I'm wondering if this girl hit her 'moment' in class and I had the pleasure of watching. Mind you, I'm not one to enjoy other's misery or misfortunes, but holy smokes! If I almost said something, you know it was bad. You can ALWAYS learn something. Even if you're an expert. Even if you've been doing it for years. Even if that something is simply: that woman over there is a complete doofus. Or: those mini bundt cakes look amazing. I'm always amazed at how self-absorbed and narcissistic some people can be. As for these mini bunts...I could really get self-absorbed in one of these! at least there's cake. This beautiful, beautiful cake!! Would this work in a regular size bundt pan or is there not enough batter? Yea those people ruin it for everyone who pay good money to go to a class and make the instructor feel bad in the bargain. Oh my gosh I would have so wanted to slap her. Urghhh!!! Silly woman with some serious issues. I love the cocktail bundts. This will be perfect after a class like that. OMG! That is hilarious! People are crazy. I would take some classes! Ha ha I love your honesty, people like that are such a pain! I adore that mini bundt pan so fab! This is the first Black Russian I've met that I'd like to put in my tummy! ;) Love that photo! Yikes! I woulda punched that girl. Good for you for taking classes to broaden your horizons! I love your bundt cake and the black Russian idea. But I tell you your story was a read out loud to the hubby kind of story and your are right one in every group situation. Could I substitute Baileys for the Kahula? You can certainly try it. You'll definitely have to play around with the recipe as Baileys is already a cream based liqueur and may alter the results.